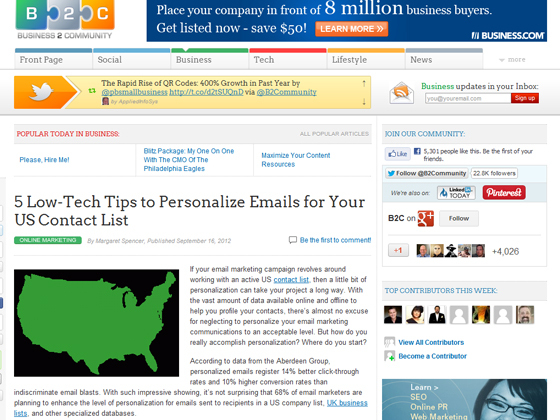 If your email marketing campaign revolves around working with an active US contact list, then a little bit of personalization can take your project a long way. With the vast amount of data available online and offline to help you profile your contacts, there’s almost no excuse for neglecting to personalize your email marketing communications to an acceptable level. But how do you really accomplish personalization? Where do you start? According to data from the Aberdeen Group, personalized emails register 14% better click-through rates and 10% higher conversion rates than indiscriminate email blasts. With such impressive showing, it’s not surprising that 68% of email marketers are planning to enhance the level of personalization for emails sent to recipients in a US company list, UK business lists, and other specialized databases. This massive drive toward personalization has produced a lot of tools and techniques to achieve more granular and accurate targeting capabilities, often requiring advanced marketing automation systems to carry out. But, despite the allure of sophistication, a few simple and relatively low-tech methods for personalization remain very effective in their own right. Here are five such techniques. 1. Humanize the “From” line. The from line is the first place where all personalization should start. A lot of emails use company or department names to populate the From line, a practice which directly contradicts the whole point of sending emails in the first place – to engage in a conversation. To avoid this common mistake, you need to use the sender’s real name in the From line as well as any other location on your message that requires disclosing the sender’s identity. 2. Address readers by name. Some email copies often overlook the value of addressing readers by name. This is a simple yet very powerful aspect of the email message, especially at the early stages of the campaign, where you and your contacts are still getting acquainted with one another. You absolutely need to refer to your readers by name, preferably their first names. The technology to do this effortlessly on an industrial scale has been practically around for decades now.